YoYoExpert Blog & Yo-Yo News – Check Out The All New General Yo Amplitude! 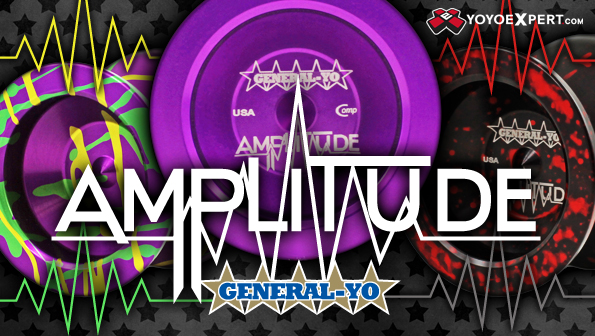 Check Out The All New General Yo Amplitude! General Yo – We don’t exactly know how they do what they do but we do know that this small American company puts out some of the best yo-yos on the market! Each precision design is seemingly more badass than the last – And their newest creation is no exception! Get ready for the General Yo Amplitude! The Amplitude is yet another performance machine from the legendary General Yo. General Yo gave the Amplitude a lighter weight than you would expect in a competitive yo-yo design but with the unique weight distribution it works so perfectly! The light weight, deep angled profile, and perfect rim weight make the Amplitude an amazing throw for anything from fast tech play to sweeping horizontal moves. General Yo never lets us down with their high performance designs – The Amplitude is a lightning fast, super smooth and maneuverable competition level throw that will amp up any freestyle routine!